Drafted as a college senior out of Creighton University in 20th round. He had great numbers in college but really didn’t project as much more than a good organizational first baseman. After signing Ruf spent a short time in the GCL before being sent up to the NYPL. He put up solid numbers but showed more doubles power than the ability to hit home runs consistently. Ruf was sent to LKW to start the 2010 season and was promoted to Clearwater after 115 ABs. He put up solid hitting numbers with a good average and solid doubles power. In 2011 the Phillies sent him back to Clearwater where his slugging went up by 50 points as he hit an impressive 17 home runs in a notoriously bad league for hitters. His walk rate also improved a greatly as he put up a .308/.388/.506 stat line. In 2012 Ruf opened the season playing for Reading and from April to July he put up good but not spectacular numbers. In August he had a historical month hitting 20 home runs and a stat line of .362/.422/.966 overall for the month. He ended the season with a stat line of .317/.408/.620 with a minor league leading 38 HRs, he hit another home run in the playoffs before Reading was eliminated. After the AA playoffs he was called up the big leagues where he hit .333/.351/.727 in 33 ABs adding 3 more home runs bringing his season total to 42 HRs. 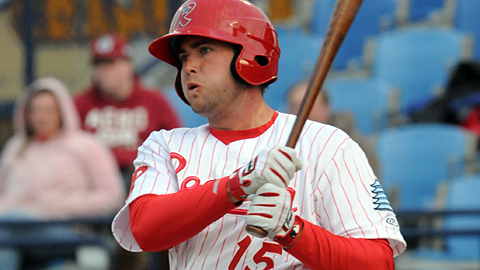 He earned the Paul Owens Award for the best player in the Phillies minor league season. Towards the end of the season the Phillies began playing him in left field. Baseball America rated him the #9 prospect in the system going into 2013. Summary: Ruf is really a first basemen only and his range will be a huge liability in the outfield despite improvements in his route running. His hit tool projects to be a bit below average at the major league level but the real question is how much it will allow his raw power to play. Upside: Ruf has always been old for his level but so far has excelled at each level. There is no real good comparison for a player with similar success at each level so he will have to prove it at the major league level. His power could allow him to stick in the majors if his hit tool allows him to make enough contact against advanced pitchers. Physically he may be able to slim down and gain some speed but he is otherwise a finished product with little room for projection. He is not an outfielder and is best suited for first base or DH. His likely major league future is as a platoon player or bench bat but there is a non-zero chance that he can continue a fraction of his AA season to be a major league starter for a few years. How is Ruf’s power tool not rated 80? Once a player’s shown a tool, he can only lose it due to age or injury. From August, in the minors (20), playoffs (1), majors (3), and winter league (10) Ruf hit 34 home runs for at grand total of 52 home runs for the year. His 20 homers in one month tied Sammy Sosa’s all time professional baseball record. Because it isn’t, at best I would project him in the 30-35 HR range which is 70 power. I don’t throw 80s around unless I am 100% sure (frankly the only two 80s in the system are Quinn’s speed and Giles’ fastball). If you are looking at people with 80 game power the list likely is Braun, Stanton, Cabrera, Hamilton, Granderson, and possibly Encanarcion, Howard (it is huge power but it might be a 70 now because of limitations on tapping into it), and Dunn (just imagine for a second how they would do in Reading). I would add that Harper has easy 80 raw power but it is not an in-game skill yet. 70 power is really good, if it was 80 power we would be really talking about Ruf as a lock prospect. A 50/70 player is likely to bat .260-.270 with 30-35 HRs if given a full season of ABs. This blog has “Hit For Power:60/80” for Dylan Cozens, so he and Greene are given 80 power potential. I think Ruf has as much power upside as those 2, so I still put Ruf as 70/80. Nice summary. I agree that there are few players who take his career path. All I can say for him is that he has hit well at every level. Until this year I wonder what his raw power value would be, because there are plenty of good hitting 1B (think Rizzotti) who cannot make the majors. Just as a question since I thought I read it in the comments at some point, that Ruf was a Gold Glove 1B in college. I have no idea if that means as little in college as it does in the majors and I have not idea how his fielding has progressed professionally. Just mentioning since I think it might mean he could be a 50 or even 60 upside fielder at 1B. In the OF, I think 30 to 40 is right on. He will never have any range due to lack of speed but I think his arm is average for an OF. I do think he could also play in RF due to the average arm though he’d still have no range. I mention that, just in case Phillies get a Soriano or Kubel type who is stuck in LF only. Was second on the team in home runs with eight ..
Finishing second in RBI with 201, third in total bases with 423 and in hits with 275, sixth in walks with 135, seventh in doubles with 57. • Named to the All-MVC First Team and the MVC Scholar-Athlete First Team. • Led the team with a .347 average. • Drew a career-high 51 walks. • Struck out a career-low 23 times. • His .545 slugging percentage was a Bluejay high. • Had a team-best .483 on base percentage. • On the basepaths, had a career-high two stolen bases in three attempts. • In the field, had a Creighton high 551 putouts, and team-best .997 fielding percentage. • His two errors tied a career-low. • His .397 average against left-handed pitchers was second on the team. • One of two players to start in all 58 games (Steve Winkelmann). • Tied for the team lead with 110 total bases (Steve Winkelmann). • Was named Joe Carter MVC Player of the Year. • Set a school record with 597 putouts at first base. • Awarded the Rawlings Gold Glove as the nation’s best fielding first baseman. • Led the MVC with a .463 on-base percentage. • Voted to the CoSIDA/ESPN the Magazine All-District VII First Team. • Started a career-high 61 games at first base. • Had a hit in eight of his first nine games. • Started in all 52 of the team’s games, the only freshman to do so. • Was third on the team with a .291 average. • Three of his four home runs came on the road. • Third on the team with 55 hits. I saw Ruf in one game last season. It was in Harrisburg during his streak. He hit one out in the first inning and made a great adjustment and catch on a double play throw from Hanzawa that hit the dirt about ten feet in front of him. If fifty is average, I’d give him a fifty-five as a first baseman. Ruf’s arm may be better than 50. In 2.1 career innings pitched (9 batters faced) his ERA is 0.00 with 1 hit, 1 K and 1 BB. According to Bill James’ and Fan Graphs 4 component speed scores the last few year’s Ruf’s his speed should be 30. Certainly not 20. His speed scores in Reading and back are better than Valle’s (40 speed) and Joseph’s (30 speed). Ken, I love Ruf, but his power is not an 80. People are starting to throw around 80 scores like they are common. At any one time, one, perhaps two, major leaguers score an 80 in any given category with a few 80s in the minors with projection for more as players mature. For instance, let’s talk 80 power. Stanton has 80 power, Hamilton is pretty close (70 or 75) and Harper will almost certainly be there in a few years. I think that’s about it. As best as I can tell, the only Phillie major or minor leagiers who score 80 in any category are as follows – Quinn – speed; Hamels – change-up; Galvis – fielding. Revere is close in the field but not quite there due to his arm. Aumont has a few pitches that could grade out around 80 if everything goes right, but, man, his command is nowhere near good enough right now. A 70 score is outstanding. I think Ruf’s 70 power score is accurate. That means he has the power of an all-star corner outfielder. The kind of power that Matt Holliday or Jose Bautista possess or Vlad Guerrero at his peak. Big time power. The same power Howard has right now when healthy. catch …you forgot Mike Trout…he could be a 70s across the board also. Nope, didn’t forget Trout. I was just givimg examples of 80 power – he does not have 80 power, but he is an 80 fielder and may have 75 or 80 contact skills. But in terms of an overall average grade for everything he is the best in baseball. A five tool superstar. The closest thing to Willie Mays since Barry Bonds in his early prime. If you call command/control a gradeable skill (perhaps it is), then I agree with those grades for Lee and Halladay. Other than that, I respectfully disagree. Lee has a good change-up – an 80 would be otherworldly change-up – it isn’t that good, in fact it’s nowhere near as good as Hamels’ change – it’s a 65/70 tops, I actually think his curve is a better pitch. Halladay’s sinking fastball was once around 75 – last year it was around 60, at best. Like Lee, none of Halladay’s pitches was ever a 75 or 80, it’s the 80 command/control, plus the ability to throw multiple above-average to plus pitches that makes (made?) Halladay so great. Howard perhaps had 80 power or close to it in the 2006-09 era, Since then, it’s been about a 65 or 70. When healthy, he might be around a 70. Giles has a great fastball, but it can’t be an 80 pitch if he has borderline control, let alone command, It’s fair to say it’s a 65 or 70 pitch with 80 upside. He’s not there yet, not even close. I agree about Halladay and Lee. Their stuff sometimes gets underrated because their control is so good, but I don’t think either had any individual pitch that was/is at that level. Unless you count command/control as part of the grade of each pitch, and not something separate. Howard hasn’t been 80 power since before his leg problems. I’d give him 80 power for the years 2005-2009. Since then, more like 65-70, when healthy. His age is really starting to show. Not sure I’d give Halladay’s FB an 80 for 2012. Hopefully it rates that again in 2013. I’d say José Bautista has 80 power. He led the AL in HR and HR/AB in 2010 and 2011 with 54 and 43 homers those years. Last year despite injuries he hit 27 homers in 332 AB, as good a home run rate as in 2011. Bautista put up WARs and negative BtRuns every MLB season until his age 28 season in 2009. Until 2010 he never hit more than 24 homers, and they were mostly at AA as a 24-year old. His power broke out at 29. Is Bautista not an 80 because of injury concerns or because he was a late bloomer, as some people may consider Ruf to be? Bautista may be a tick below 80, but you could certainly make the argument that he has 80 power. He hits the ball a long, long way. And Hamilton might have 75 or 80 power. Ruf and Mikael Franco…how do they compare when it comes to speed? Ruf is faster than Franco… Franco is only a bit faster than Jose Molina (really slow) on the basepaths. Thanks for all the comments! I like reading all the discussions. The purpose of my post here was more about his arm and speed. I asked about his power in an earlier post above. Is his arm a 50? Is his speed a 20? If his arm is just 50, then why was he used as a pitcher twice (once for Clearwater and once for Reading) the past couple seasons? If his speed is 20 then he must be a very good baserunner to average a 3 speed score. I was there in person at Washington when Ruf hit his triple of of John Lannan, displaying hustle, base-running ability, and center-field power, if not speed. The next day I watched on TV as he hit 2 homers, 1 off T Gorzelanny, 1 off T Clippard. The Nat’s were trying to win both games, the first to clinch the division, the second to clinch the home field throughout the playoffs. This blog has Green rated 50/80. Can we call Ruf 70/80? A 2912 pro-baseball leading total of 52 homers in the year including 34 homers AFTER July 31 seems like big time power to me. Ten were in a half of a Venezuela winter league season. One was an Eastern league playoff. Three were in the big leagues. 20 were in the month of August in the Eastern league (tying Sosa’s professional record for any month, which is why I thought he is already an 80). Now I read that Ruf won the Rawlings Gold Glove as the nation’s best fielding college first baseman and that Puddnhead rates him slightly above average at 55. I understand that at 25 Ruf was old for AA, but that does not take away from his tools, only his growth potential, but many players improve their power numbers between ages 25 and 29 with experience, better coaching, and better strength training once they hit the majors. Now I have one new question. Is the 50 hitting tool for a 305 career minor league hitter right? His worst minor league season average was 290 in 2010. He does strike out a lot, as big time power hitters tend to do, but I like it a lot that he also walks a lot and has a 386 career minor league OBP. Ruf really isn’t very fast. I also would not give him 80 power. If we thought he had the ability to hit 50+ HR in a major league season, as Howard did in this prime year, then yes he would have 80 power. I just don’t think he projects to that many big league HRs. Neither do any of the analyst projections I’ve seen rate his major league HR power that highly. Pitchers is AA and VZL just aren’t equivalent to the average of major league pitching that Ruf will face. Ruf benefitted a lot from being old for AA and likely also had a career season. He really didn’t show that level of power previously. I think the most realistic projection for him is Howard-light. In his prime season, this year or next, he might reasonably project to 35 HR and then fall off on the same fairly fast slope that Howard has traveled. Neither of these guys are great athletes. Agreed. Ruf is probably a better athlete than Howard but does not have his power. Sorry, I need to proofread better before posting. I should have taken the 2 “a lots” out of my last sentence. He draws walks a just little more than average, which may be due more to his pitchers pitching around him rather than an exceptional batting eye. Matt Holliday does not have close to 80 power. Agreed. My point about 80 scores seems not to be getting through. Let me explain what an 80 score means – it means the best possible grade a player can get for a particular tool. We are talking about historically great tools. As for power, an 80 means, usable, functional, in-game power. In terms of historical references, there probably only 30-40 players in the history of the game (I would need to run through the names, but could do it if given the time) who score an 80 in power. By way of reference, the most proflific, non-chemically enhanced home run hitter of all time, Hank Aaron, did NOT have 80 power – it was probably 70 or 75, at most. Roger Maris did not have 80 power. I don’t think Ken Griffey, as great as he was, had 80 power. Examples of 80 power (non-chemically enhanced division) include names such as Babe Ruth, Lou Gehrig, Mickey Mantle, Willie Mays, Jimmy Foxx, Hank Greenberg, Ralph Kiner, Willie McCovey, Frank Howard, Reggie Jackson, Frank Thomas, Willie Stargell, Harmon Killebrew, Dave Kingman (horrible baseball player but, without any question in my mind, the player with the most power I ever saw – I saw him hit several balls that must have been close to 600 feet – completely surreal), Mike Schmidt, Jim Thome, A-Rod at his peak, maybe Ryan Howard at his peak, and, currently, Giancarlo Stanton, maybe Ryan Braun and, soon, Bryce Harper. With few exceptions (cough, cough, Dave Kingman), these are the slugging luminaries of major league baseball. Sorry, but Darin Ruf does not have 80 power. And I really like Ruf. The comparison to Holliday is a good one. While he is nowhere near the baseball player that Holliday is, his power might be similar. Holliday does not have 80 power – he’s more like a 70, which is game-changing power. All-star corner outfielder power. It’s a huge compliment to say that someone has a 70 tool. As for 20 homers in a month a Reading, it’s a huge accomplishment, but for a slow 26 year-old (while last year was his age 25 season, he hit 20 homers in a month after his birthday) in a very favorable hitting environment, it does not lead to the conclusion that the player has an 80 grade big league tool or make the player comparable to Sammy Sosa. Bottom-line, its not always the number of HRs hit…but the distance a player can hit them. In large part. It is the ability to drive all kinds of pitches, thrown to all parts of the plate, well out of the park in game situations. Also, I forgot Pujols – not sure he has 80 power now, but he did for many years. So what do you think of this blog giving Cozens and Greene 80 future power projections? Seems unrealistically high, don’t you think? They are both solid prospects, but the chances that they develop Ryan Howard’s power are extremely remote. Every draft produces quite a few power prospects. Most, like Hewitt, don’t come close to sniffing at the potential that was declared for them. Undeveloped power is a very tough tool to evaluate. You’re imagining something that isn’t really present. Probably why scouts are so big on things like speed, arm strength, fielding ability, where you can at least see what you’re getting. They both have that kind of projection (I think we are taking 80 a bit too mythical, the numbers translation is the ability to consistently hit 40+ HRs in a season in neutral conditions, this is not hard and fast but a good estimate), both however carry enormous risk in reaching that potential but they are both huge power prospects. If you were to put a physical comp on Cozens the player that comes to mind is Adam Dunn and for Larry Greene he is reminiscent of Prince Fielder. It is likely that neither of them will have that projection when they reach AA (if they reach AA), Ruf has his power in AA and you aren’t projecting anything on it. BTW 50 Hit, 70 Power is very generous considering the projections that most models and experts have for Ruf. It just cheapens an 80 power rating in my mind. One major leaguer comes up perhaps every 5 years with 80 power and the Phillies signed two in the same draft? And neither a top first rounder? No. I like both Cozens and Greene as prospects, but it seems homerism to give them both 80 power. We listed upstream the very few Phillies with an 80 tool. I see Quinn with 80 speed. Maybe Revere comes close at say 75. These ratings scales are scales where the gap between 70 and 80 is very large. 80 is exceptional. At this point, Ruf is a lot closer to an 80 than either Cozens or Greene and I wouldn’t give him higher than a 70. An 80 is Burrell, Schmidt, Howard, Luzinski (maybe). Even Utley isn’t more than a 70 for power. I do not think that Holliday is not close to 80 power. Neither Jayson Stark nor his scout source said that either. Holliday averages just 25 HR per season, and that includes 5 years at Colorado. But Holliday is also a 300 hitter, just like Ruf has been his whole minor league career. Maybe Ruf’s 50 hitting tool should be higher. I’d guess 60 based on his career numbers. I don’t know how good a hitter or slugger Ruf will become in the majors, but I’m looking forward to finding out over the next few seasons. No matter how fluky 20 homers in a month were, Ruf was not the first minor leaguer over 25 years-old in the history of baseball. But he was the first ever to hit 20 HR in 1 month. That is a historic very impressive accomplishment and definitely shows real power potential. How can anybody know that 2012 was his “career” year until his career is over? I do not expect it, but I would not be surprised at all to see Ruf have a 40 HR year in the majors and average greater than 30 HR over a peak period of 3 or more years. I can certainly see Ruf’s hitting tool being above 50. Perhaps as high as a 60. I think he has a chance to be a better contact guy than Howard. I doubt that his minor league BA will carry over to the majors. I’d look for about a .270 BA as what Ruf possibly MIGHT do in the majors and perhaps 35 HR.